Updated Monday June 4, 2018 by Whitby Minor Baseball Association. The Whitby Chiefs are champions of the Vaughan Vikings Minor Bantam AAA tournament! The Chiefs spent the weekend travelling back and forth to Vaughan on the 407 from June 1st-3rd. Whitby started strong on Friday night beating the Martingrove White Sox. Lukas Reid pitched the complete game and allowed only one hit while the Chiefs offense churned out twelve runs in the 12-0 win. Saturday morning was a different story. The Chiefs managed to score only one run, in a disappointing 8-1 loss to the Mississauga North Tigers . It would be Whitby’s only loss of the tournament. This team has showed an excellent ability to rebound so far this year and Saturday was no different. Whitby took down the host Vikings in game three by a score of 3-2, scoring the winning run on an exciting squeeze play at the plate. The win allowed Whitby to snag second place in the division and put the team through to the quarter finals. The Saturday night quarter final was a back and forth affair against the Windsor Stars, but the Chiefs would come out on top 5-4 – the Semi’s were up next! Sunday morning, Whitby found themselves up against a strong Brampton team. This was the second meeting of the clubs this year, with Brampton beating Whitby handily in the first matchup at a previous tournament. The Royals didn’t fare so well this time. Zak Szabo went 5 complete innings and Whitby’s bats came alive as the Chiefs cruised to a 10-0 victory. In the final, Whitby would face a major test – the North York Blues. 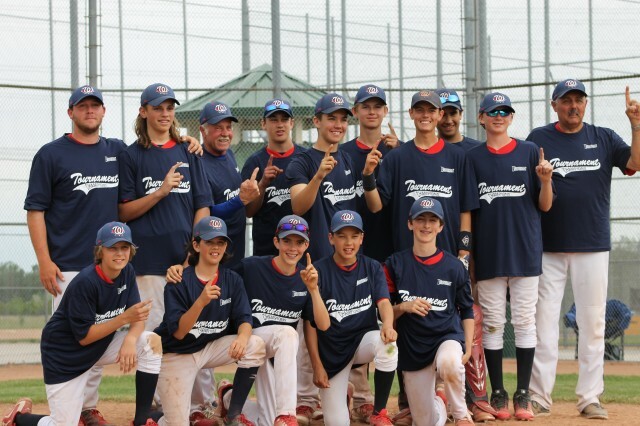 North York have been the winners of the past two OBA championships as well as the 13U Canadian championship last summer. Nick King, Liam Conway and Lukas Reid got the job done on the mound while the offence pounded out a ton of big hits. The Chiefs went on to win the championship by a score of 11-7. Team members are – Garrett Joss, Kayden Chung, Greg Lachance, Zak Szabo, Jackson Hutchison, Nick King, Liam Conway, Lukas Reid, Erik Smith, Griffin Catto, Cody Hagerman and Brett Brannon. Coaches are Gerry Prendergast, Clare Osborne, Marcus Rozsa, Ryan Verrydt and Manager Debra Hutchison.